ECSTASY ADDICTION | LGBTQIA+ Rehab. Need Help? Inspire Recovery. MDMA, most commonly referred to as “ecstasy,” and in more recent years, “molly,” is a widely used recreational drug with both stimulant and hallucinogenic properties. Its use became popular in the 1980’s with the emergence of dance club “rave” culture, which first appeared in Europe and then in the United States. The drug is appealing at all night electronic music events because of its stimulating effects and the pleasurable sense of well-being and euphoria associated with it. It was briefly considered in some sects of the psychology community regarding its possible benefit towards psychotherapy, but contemporaneous studies of its adverse affects on the brain led it to being placed under Schedule 1 of the DEA’s illegal substances in the mid 1980’s. Research has shown that ecstasy use causes damage to the brain that can result in significant impairment to memory and the ability to learn. This damage can be long term and maybe even permanent. Regular use of ecstasy and ecstasy addiction can cause severe depression. MDMA releases massive amounts of serotonin in the brain, which is the neurotransmitter chemical in the brain that is responsible for, among other things, the regulation of mood. The ecstasy high resulting from the serotonin release MDMA initiates tends to deplete the brain’s overall supply of this neurotransmitter. Ecstasy addiction could result from a user trying to avoid the consequential depression by using more of the drug, but further use only further exacerbates the depression. Continuous usage and higher doses of the drug increases the likelihood of brain damage. 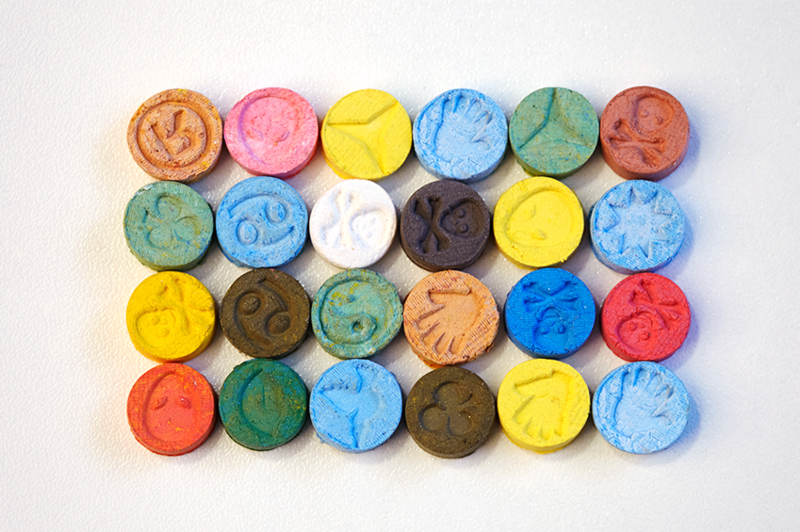 Further adverse reactions to ecstasy use include paranoia, anxiety and sleep problems. Sometimes deaths are attributed to ecstasy resulting from dehydration or over-heating of the body. It’s also an important point to consider that decreased availability of actual MDMA has led to other research chemicals and newly synthesized substances being sold to users as ecstasy. The effects of these various other substances are far less known and carry their own risks and dangers. Like other stimulants, ecstasy can be profoundly psychologically addicting. Whether it is an obsession with the euphoric high, or a desperation to avoid the inevitable crash, ecstasy addiction can quickly consume someone’s life. Although drugs like ecstasy—”party drugs”—are less typically used by addicts further progressed in their disease, ecstasy addiction is not so uncommon. The trend that ecstasy is considered less harmful than other drugs in some circles doesn’t make ecstasy use any less dangerous or the risk of developing an ecstasy addiction any less real. If you or anyone you may know is suffering from an ecstasy addiction, the associated depression and the other adverse consequences of prolonged drug use, Inspire Recovery can offer a path to a better life through comprehensive addiction treatment. The freeing journey towards recovery from addiction can begin today. Take the first steps.